Background: The Janus enzyme family is regulated by various cytokines together with interleukins, interferons, and hormones like glycoprotein, thromboprotein, and hormone. Metamorphosis and translocations in the Janus Kinase genes leading to constitutively active Janus Kinase proteins are associated with a variety of hematopoietic malignancies, comprising the myeloproliferative disorders, acute lymphoblastic leukemia, acute myeloid leukemia (JAK2, JAK1), acute megakaryoblastic leukemia (JAK2, JAK3). Hence the study of the inhibitors of Janus Kinase is desired. Results: The best GA-MLR equation based on four descriptors along with statistical parameters is obtained using QSARINS software. 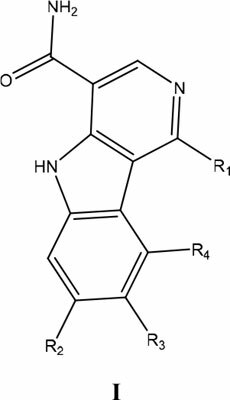 Using the model expressed by this study we predicted some new compounds of high JAK2 inhibition potency. Each predicted compound has very high potency with which only a few compounds of existing series can match. Conclusion: The QSAR and molecular modelling studies suggested that still better compounds can be designed if the flexibility of the molecules can be increased for which attempts can be made to have more saturated atoms in the molecules. Such a compound predicted by us was found to have interactions with the enzyme JAK2 almost in the same manner as the FDA approved compound, Momelotinib. Keywords: Janus kinase 2 (JAK2) inhibitors, tyrosine kinase, quantitative structure-activity relationship study, docking study, ADMET, myeloproliferative disorders. Keywords:Janus kinase 2 (JAK2) inhibitors, tyrosine kinase, quantitative structure-activity relationship study, docking study, ADMET, myeloproliferative disorders. Abstract:Background: The Janus enzyme family is regulated by various cytokines together with interleukins, interferons, and hormones like glycoprotein, thromboprotein, and hormone. Metamorphosis and translocations in the Janus Kinase genes leading to constitutively active Janus Kinase proteins are associated with a variety of hematopoietic malignancies, comprising the myeloproliferative disorders, acute lymphoblastic leukemia, acute myeloid leukemia (JAK2, JAK1), acute megakaryoblastic leukemia (JAK2, JAK3). Hence the study of the inhibitors of Janus Kinase is desired.